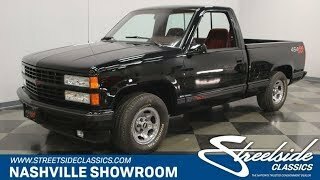 Hi, I am interested in your 1992 Chevrolet Silverado 1500 2WD Regular Cab 454 SS (stock #1290-NSH) listed on Autotrader for $23,995. I'd like to get more information about this vehicle and confirm its availability. The ad copy for this truck when it was introduced said Its got a mean streak . With the power of Chevys infamous 454 under the hood, and the fact that it only turns the rear wheels, this truck is certainly capable of leaving a couple other streaks too. Fast, comfortable, and practical to boot. What more could you ask for? Check it out. Trucks have come a long way from their roots as basic work vehicles. They are frequently used as daily drivers, and not only because people need them to get to work. Sometimes its because people like sitting up higher, being able to see traffic better, and feel safer in a larger vehicle. This SS is a prime example of all that. Plus, its just a good-looking truck. It is coated in glossy Black paint with body colored bumpers with an eggcrate grill, also in Black with a red Chevy bowtie in the center. There is a 454 SS front tag in the center flanked by factory fog lights below it. The headlights, fog lights and marker lights have all been upgraded to LEDs. The body side molding on the door has another bowtie and 1500 in red, and 454 SS appears again on the rear fenders. There is a rubber mat protecting the bed and if you lift it up, you will see that it has done its job protecting it very well. The Red cloth interior of this truck looks great and cradles its driver and passengers in the lap of luxury. The door panels have long, comfortable armrests and the switches for the power windows and locks are right at your fingertips. The high back bucket seats have pleated seating surfaces with smooth side bolsters and fold down armrests. Super comfortable for cross town errands or long-distance traveling. The huge center console with cup holders is also quite convenient. A 4-spoke steering wheel is mounted on a tilt column with the shifter for the automatic transmission and cruise control stalk within easy reach. Behind them is a stock dashboard with the engine gauges in a line across the top just over the speedometer and tach. There is an FM/Cassette stereo for your listening pleasure and the ventilation controls include those for air conditioning to keep you cool on those hot summer days. Pop the hood and you will find Chevys torquey 454 cubic inch big block motor nestled down in a neat and clean engine bay. It is all stock and original with a glossy black air cleaner and fuel injection. Finned black and silver valve covers look great and have 454 badging. This truck has obviously been well maintained and you can see the new serpentine belt as well as newer hoses, cap and wires as well as a new Optima battery. There is an LED light under the hood too which is nice for keeping good tabs on things even at night, and the power this engine makes flows out through a 4-speed automatic transmission to the rear wheels. Power front disc brakes with anti-lock action on the rear brakes assure that you can get this truck stopped in a hurry regardless of whether you are carrying a load or not. The rubber meets the road through 275/60R15 tires mounted on 5-lug polished wheels with Chevy center caps. Good looking, well cared for, comfortable, and capable of making some mean streaks. Come on down and check this truck out.